A central thesis of Chap. 8 is that aesthetics, via bioempathy, provides a bridge between “is” and “ought”. Without it, there cannot be an ecologically informed ethics or ecological justice. The final chapter of this book seeks to both illustrate and argue for such a bridge—or what is perhaps more accurately described as a circumvention of the problem. The author provides an illustration from his own experience illustrating how the “is” and “ought” gap is circumvented in real life. Experiences of beauty in nature (an intrinsic value) can result in bioempathy (a subjective affect), which in turn produces good citizenship in the biotic community. This avoids the naturalistic fallacy by (1) providing for rational inferences from descriptions to prescriptions (and proscriptions), and (2) providing a motive for adhering to the same. Experiences of natural beauty, particularly of living beings and systems, induce bioempathy, which moves us to show appropriate respect and restraint in our treatment of nature. At the same time, recognition of beauty as an intrinsic value provides a rational ground for pertinent prescriptions and proscriptions. Thus, inferences from description to prescription, from “is” to “ought”, don’t have to be metaphysical leaps of faith. One can argue that we human beings have a moral duty to each other to conserve natural ecosystems and biota because our lives and our well-being require them. 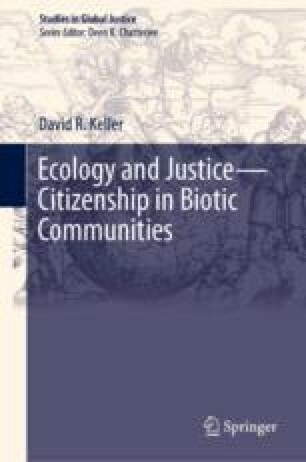 But a big part of the argument of this book is that we also have a duty to conserve ecosystems and biota for their own sake; and furthermore, that this is a practical necessity for fulfilling our duty of care to each other and to future generations—that is, to being good citizens of the biotic community. Supposing this is correct, what is there to ground our duty to conserve ecosystems and biota for their own sake? Why should we care? If the argument is not to be wholly anthropocentric, then it seems we must grant intrinsic value to non-human nature, or at least to much of it. The intrinsic value of nature, then, is the ground of our duty to be good citizens of the biotic community. Furthermore, this is not posited merely for the sake of the conclusion and in defiance of the naturalistic fallacy. Both Keller and the author of the Chap. 10 argue, in different ways, that nature possesses intrinsic value and that this value is beauty. Because this beauty is objective and real, it provides both a rational justification and a motive for conservation that is independent of strictly anthropocentric considerations.